This small garden occupies a triangular parcel of land measuring some 379 square metres formed by the junction of Jersey Road and Ocean Street, Woollahra. The reserve was once part of almost an acre of land which from the 1860s supported the offices, works and residences of the Woollahra administration. The Euroka Reserve is of special significance in municipal history as the remaining council-owned portion of that property. The site chosen in 1863 for a council headquarters was part of the extensive local landholding of the Cooper family – land acquired from Captain John Piper by the firm of Cooper and Levey, concentrated by 1847 in the sole hands of Daniel Cooper. Much of the land in the nineteenth-century suburb of Woollahra was developed under leasehold to the estate. Woollahra Council likewise established its Ocean Street complex on land leased from the Coopers. In 1844, while the land was still held jointly, the Cooper and Levey partnership commissioned a survey and plan of subdivision of the estate from Thomas Mitchell, with a view to its eventual release. The Ocean Street site is shown as portion ‘P’ in Mitchell’s scheme, bound by Jersey Road, Ocean and Trelawney streets and recorded as measuring 1 acre, 1 rood and five perches. A decade later, when leased to Mary Ainsley, the land was described as an area of 3 roods 2 perches, a reduction presumably resulting from alterations to the width and alignments of the streets which bound it. 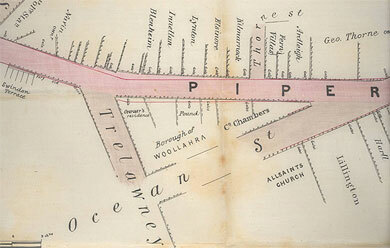 The parcel of land is identifiable in the first municipal assessments compiled by Woollahra Council, shown as an unimproved allotment measuring 3 roods 2 perches and held by Captain John Broomfield. The two known lessees of allotment P prior to its transfer to council would appear to have had little influence on its history. Certainly neither fulfilled the conditions set out in the terms of the leasehold from the Cooper estate, a covenant attached to which required the erection of ‘a substantial brick or stone house of not less than eight rooms’ on Lot P. The land remained unimproved until after council acquired the site. Mary Ainsley was a widow who entered into the lease agreement for Lot P on 1 December 1855 for the annual sum of £7 14s. By 1860, council rate records indicate that the lease was held by Captain John Broomfield, a shipmaster-turned-merchant who appears to have made his family home in the Pyrmont-Balmain area. While he was active in local government elsewhere, and while his mercantile and commercial activities brought him into frequent contact with Woollahra residents such as Daniel Cooper and Samuel Deane Gordon, Broomfield does not appear to have made any contribution to the local area other than his agreement to sell the residue of his lease on Lot P to the Woollahra Council. Over a century after he relinquished Lot P to the council, in 1972 Broomfield’s surname was among the ideas proposed when council was sought a name for the residue of the parcel reserved as a public park. The proposal, while not adopted, was perhaps more apt than may have been realised, as Broomfield was a keen exhibitor at horticultural and flower shows around the colony, and a regular contributor to the works of the Acclimatisation Society which collected and cultivated plant and seed specimens. The Municipality of Woollahra was proclaimed in April 1860, and the need for a council headquarters was among the earliest priorities addressed by the newly elected councillors. Initially the council operated from a rented house at the corner of Edgecliff Road and Ocean Street, but efforts to secure more suitable accommodation continued. At a meeting of Woollahra Council held on the 13th August 1861, the decision was taken to accept Captain Broomfield's offer of ‘an allotment of land on the Point Piper Estate’ for the sum of £80, and the residue of the lease to the vacant island site was transferred accordingly. It was not until January 1900 that Council secured the freehold to the land, which by then had served as the site of its headquarters for nearly 40 years. Construction of the Ocean Street chambers began in 1863, and the council took possession of the newly completed building in February 1864. On the Ocean Street frontage, adjoining the rear of the main building stood the Town Clerk’s residence. Behind the chambers, the Trelawney Street end of the site was dedicated to the council depot, including the council pound where the straying stock of the district was temporarily held. Following a council resolution in October 1868, an overseer’s residence was built in this section of the complex, situated in the corner formed by the junction of Jersey Road and Trelawney Street. The rear of ‘Lot P’ was thus dedicated to what might be considered the more prosaic business of the council administration, while the organisation presented its public face to the junction of Ocean Street and Jersey Road – the latter known as Point Piper Road until 1900. The triangular area now known as the Euroka Reserve originally formed the front garden of the council chambers, overlooked by the two-storey stone building. The earliest known illustrations of the chambers show a picturesque entry to the garden from the Ocean Street frontage, through a gateway surmounted by an ornamental archway, from which hung a lantern. The original timber fencing was provided by Nathaniel Goodwin, who won the tender for the job in June 1864. Later, a formal iron fence defined the garden area, which was distinguished by this feature from the remainder of the site, where the domestic-scale wooden picket fencing was retained. Matching iron double-gates hung from decorative iron gateposts, creating an imposing entrance to the property. The gateway opened off Ocean Street immediately to the north of the chambers building, leading visitors directly to the double-storeyed portico of the facade. The curved ornamental metal fence which today encloses the garden dates from the time of the major renovation of the chambers in 1930. Supplied by the Benoak Gate and Fence Company, its design was chosen by council in part to discourage children from ‘climbing over and destroying the flower beds’. However its style and fabric also preserved the formal character of the front garden and the distinction between facade and rear of the property, which remained enclosed by timber pickets. The architect of the 1930 renovation, Mr E A Scott, recommended the retention of the 1860s pillars and gates, set within the new fence. They have since been replaced. 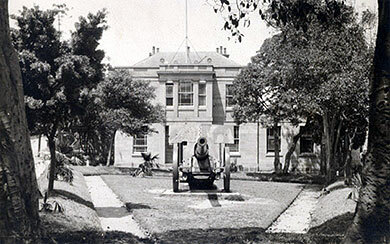 During the 1920s, the front garden was dominated by the presence of a 6" German naval gun on a field mounting, captured by Australian forces in France during World War I and presented to the Municipality of Woollahra as a ‘war trophy’. At a ceremony on 29 May 1921, the mayor, Aldermen J P Bradley unveiled the gun in its new setting, watched by a large audience of approving residents. Photographs of the front garden from this period show a triangular front lawn edged by gravel pathways, and a simple scheme of plantings with small flowering trees and palms set around the garden’s perimeter. The large trees which today define the character of the garden were already impressive in scale, some sixty years after council’s first occupation of the site. Photograph of the front garden of the Ocean Street chambers c1921. Only three years ago the plantation harboured a huge and ugly cannon which was moved to a more suitable area; and, thanks to the efforts of the council’s engineer and gardener, this insignificant section of land was transformed into an oasis of beauty. The main building of the Ocean Street complex was used as council’s offices and chambers for over eighty years, becoming superfluous to this need when the council moved its headquarters to Redleaf in Double Bay in August 1947. The following year the council leased the former chambers to the Australian engineering firm Clyde Industries for use as an administrative centre, while retaining the use of other parts of the site for continuing council business. In August 1954, as Clyde’s lease of the former chambers neared expiry, negotiations were opened between the parties for the purchase by Clyde of both the building it occupied and the vacant Town Clerk’s residence adjoining. This led to the subdivision of the site and the creation of Lot A – the garden – as an entity separate from Lot B, the latter being that part of the site occupied by the former chambers and official residence. Lot A measured 15 perches. The purchase of Lot B by Clyde Industries was finalised in 1955, and following several intervening ownerships the property was eventually acquired by the German Republic in 1976, and is operated as the Goethe-Institut. Lot C, the area of the site which had been occupied by council’s depot and the associated overseer’s cottage, was transferred from council to the developer Rancliff Gardens in 1965. Townhouses were built on this portion of the site, which is today known as No 86 Ocean Street. The suburb of Woollahra is one of the earlier and more densely settled areas of the municipality. During the first half of the twentieth century, council responded to the needs of the precinct by acquiring small parcels of land to create pockets of public open space, dispersed as ‘rest parks’ throughout the locality. Woollahra residents owe to this policy the existence of Davies and Gaden Reserves, Chiswick Gardens and the Holdsworth Street Playground. However, well before the adoption of this strategy, the gardens of the council chambers had functioned unofficially as a rest park for the district. In 1908, council considered various means of making the chambers reserve a more inviting place for the public. Council resolved to create an additional entrance from the Jersey Road side of the garden, and to provide seating and a light in the centre. At this point the lighting proposed was a gas lamp, with the extension of the electricity supply from the city still some years away. Descriptions of the garden following the 1930 renovations to the council building suggest that the landscaping measures taken in that year were sympathetic to the combined uses of the land as both formal entry to the chambers and a public resting place. I know a lovely garden ... an emerald lawn and flowers of many hues, whilst a sundial and stone carved seats add a sense of peace to the spot. There, too, a bird bath, a fountain and a pond are in readiness for feathered visitors on hot summer days. The importance of the Ocean Street gardens to the local public was clearly recognised by council in the negotiations surrounding the subdivision and sale of the Ocean Street property. When determining the terms on which the lands would be sold to Clyde Industries, the council, acting on the recommendation of a subcommittee formed to examine the proposed sale, elected to retain the triangular garden plot at the corner of Ocean Street and Jersey Road. At the request of the purchaser, council undertook to retain the land ‘as an enclosed garden area’, and the dimensions of Lot A were established to include the entirety of the curved ornamental iron fence. The actions of council in 1955 secured for the continuing use of the public a vital piece of open space in an area where it was critically needed. Dedicated as a public garden and no longer associated with the building it fronted, the triangular parcel of land existed without a name for some seventeen years. In 1971, council determined to name the reserve, partly as a means of emphasising its availability to the public and encouraging greater awareness of the facility. Ultimately the name ‘Euroka’, meaning ‘sunlit corner’ was chosen. The name was officially gazetted on 2 June, 1972. In the late 1960s, the locality and the reserve were threatened by state government plans to widen Jersey Road between Oxford Street and New South Head Road to create a major thoroughfare. The move would have destroyed much of the adjacent built environment and subjected the district to a significant increase in traffic volume. The groundswell of public resistance which met these proposals head-on has become legend in the eastern suburbs, not only for its success in overturning the decisions of the Department of Main Roads (DMR), but for the innovation of this new form of ‘people power’ through the resident action group the Paddington Society. Much was at stake at the time besides the future of Euroka Reserve, but specific concerns for the small park surfaced. In the end, the power of resident action prevailed, saving a suburb and incidentally a small public facility. Even in 1972, after the DMR had abandoned its intention to have various local Paddington and Woollahra roadways designated as main roads, plans to widen Ocean Street would have seen a large portion of Euroka Reserve sacrificed to accommodate additional traffic lanes at the junction of Ocean and Jersey Road, and the loss of the major trees planted at their meeting point. Again, the amenity was spared for continuing public enjoyment. In 1985, when council celebrated the 125th anniversary of the incorporation of the municipality, funds were set aside to enhance the Euroka Reserve in recognition of its historical significance to council. The landscaping scheme adopted was based on a formal design incorporating classical elements, including the retention and upgrading of the ornamental ponds and the restoration of various decorative features. In essence this new work echoed the schemes of the past, in deference to the history of the site. Drawing showing proposals for improvements and restoration work, 1985. Today the reserve remains a small, peaceful place between two busy roadways in a bustling suburb, the intermingled canopies of the two large figs at its apex providing a welcome profusion of greenery. The continuing relevance to the neighbourhood of this public asset is a tribute to the foresight of aldermen and councillors past.